Capes, Masks, & Tights: Part IV | Oh Sarah O ! Tonight my sketchbook is traveling to one of the founding states in American history, Pennsylvania. The Sketchbook Mobile Library will be parked in Pittsburgh, PA at Penn State University/ Market Square located at 23 Market Place. 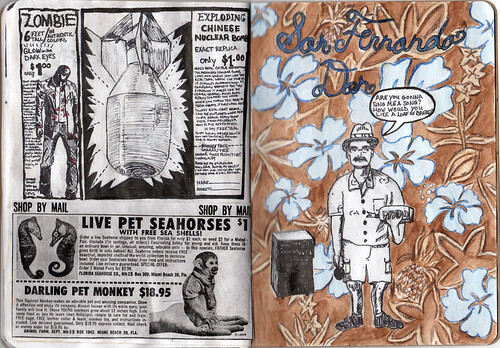 If you are in the area you can find my sketchbook under call number 220.5-8. But if you can't make it to the tour, check out the epic conclusion of my Capes, Masks & Tights sketchbook below. No vintage comic book is complete without a Yubiwaza ad. I love the quote from his wife! 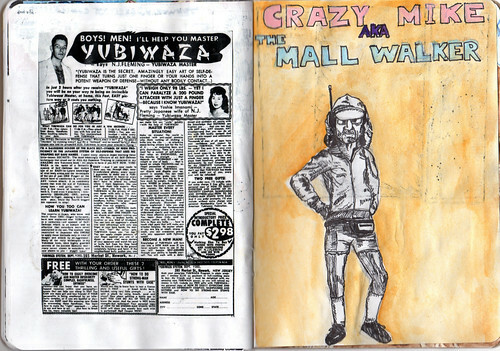 On the right is an illustration of a real-life local Wichita character, Crazy Mike (aka the Mall Walker). On the left I've combined my own ridiculous ads for a zombie and nuclear bomb with real advertisements for a pet sea horse and pet monkey. I wonder if I write to them now, will they still send me a monkey or a sea horse? One the right I've drawn another real-life local Wichita character, karaoke DJ San Fernando Dan.